Download "JAMAICA THE HON MR JUSTICE MORRISON JA THE HON MR JUSTICE BROOKS JA THE HON MS JUSTICE LAWRENCE-BESWICK JA (AG) BETWEEN GODFREY THOMPSON APPELLANT"
1  JMCA Civ 37 JAMAICA IN THE COURT OF APPEAL SUPREME COURT CIVIL APPEAL NO 41/2007 BEFORE: THE HON MR JUSTICE MORRISON JA THE HON MR JUSTICE BROOKS JA THE HON MS JUSTICE LAWRENCE-BESWICK JA (AG) BETWEEN GODFREY THOMPSON APPELLANT AND HENTLEY MORRISON RESPONDENT Ravil Golding instructed by Lyn-Cook, Golding and Co for the appellant Aon Stewart instructed by Knight, Junor and Samuels for the respondent 18 February and 31 October 2014 MORRISON JA  I have read, in draft, the judgment of Lawrence-Beswick JA (Ag) and agree with her reasoning and conclusion. I have nothing that I can usefully add. 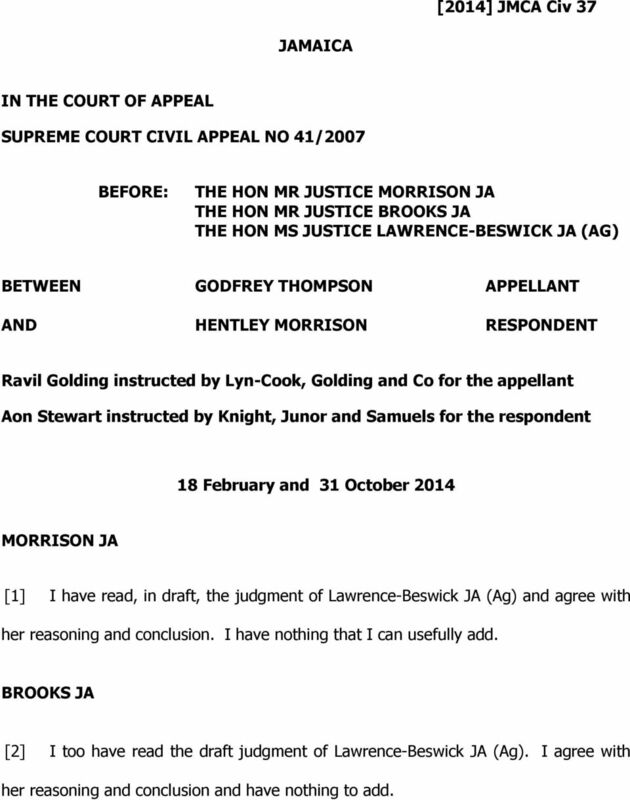 BROOKS JA  I too have read the draft judgment of Lawrence-Beswick JA (Ag). I agree with her reasoning and conclusion and have nothing to add. 3 when he arrived at the betting shop and was ready to pay for the bet, at first Mr Thompson said that he had forgotten to write it. 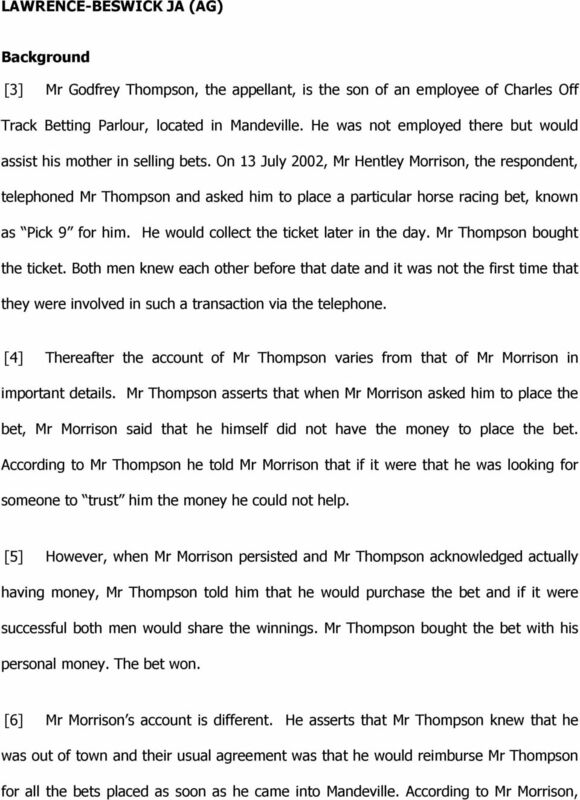 Subsequently, according to Mr Morrison, Mr Thompson acknowledged that he had written the ticket and demanded half the winnings. He refused to hand the winning ticket to Mr Morrison and, according to Mr Morrison, he also refused to accept the payment for the ticket. He acknowledged that Mr Morrison had provided the names of the winning horses but said that he would share the winnings, not because he, Mr Thompson was obliged to do so, but because they were friends. 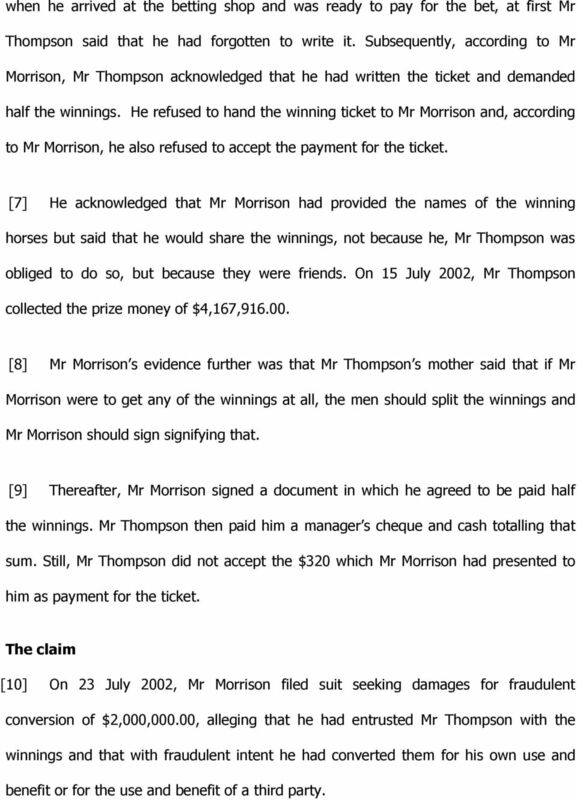 On 15 July 2002, Mr Thompson collected the prize money of $4,167,  Mr Morrison s evidence further was that Mr Thompson s mother said that if Mr Morrison were to get any of the winnings at all, the men should split the winnings and Mr Morrison should sign signifying that. Thereafter, Mr Morrison signed a document in which he agreed to be paid half the winnings. Mr Thompson then paid him a manager s cheque and cash totalling that sum. Still, Mr Thompson did not accept the $320 which Mr Morrison had presented to him as payment for the ticket. 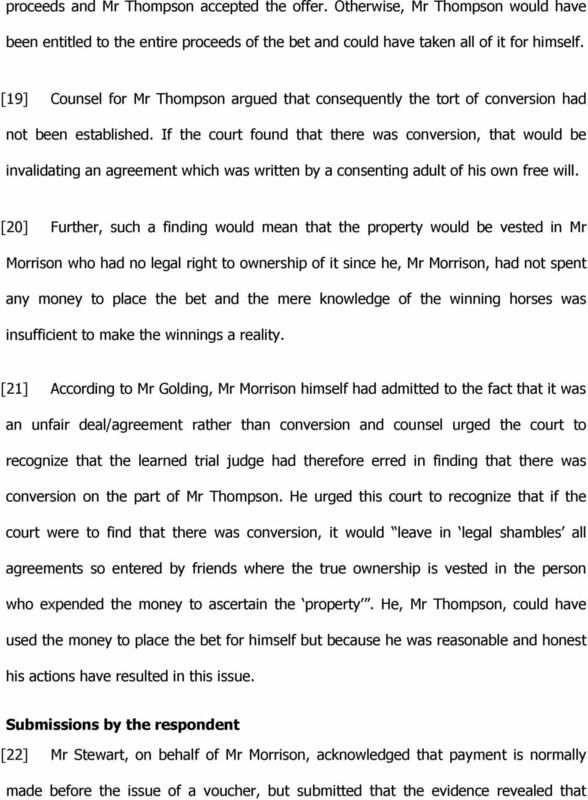 The claim  On 23 July 2002, Mr Morrison filed suit seeking damages for fraudulent conversion of $2,000,000.00, alleging that he had entrusted Mr Thompson with the winnings and that with fraudulent intent he had converted them for his own use and benefit or for the use and benefit of a third party. 8 was no such agreement was an insurmountable blow to his credibility and also cements Mr Morrison s ownership and right to possession of the Pick 9 betting ticket. He submitted that what was actually contained on the ticket, that is the outcome of the bet, was of no relevance to either Mr Thompson or the betting parlour. It was his argument that if Mr Morrison had refused to pay for the ticket because the bet had lost, he would have breached the contract. Mr Thompson would then have been entitled to sue for the cost of the ticket, and may have been entitled to deduct the cost of the ticket and any other costs which may have been incurred from the winnings, and pay the balance to Mr Morrison. He opined that in any event Mr Thompson would have expected Mr Morrison to pay the cost of the betting ticket because the betting ticket itself had not been intended by either party to be used as security of its costs, nor was that customary. 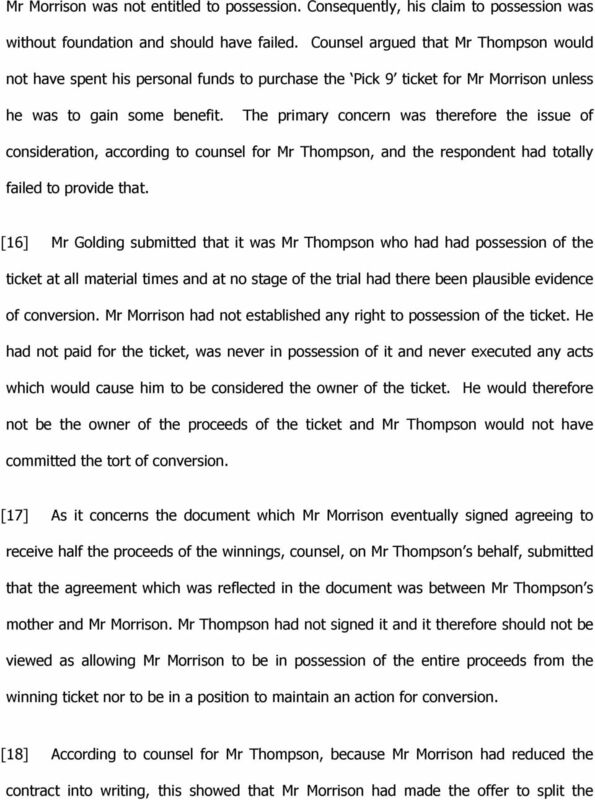 Mr Morrison s argument further was that he had attempted to pay for the ticket on the day in question and that it was not his fault that Mr Thompson had refused to accept his payment. Mr Thompson should in the circumstances be stopped from denying that Mr Morrison owned the ticket and had a right to possess it. 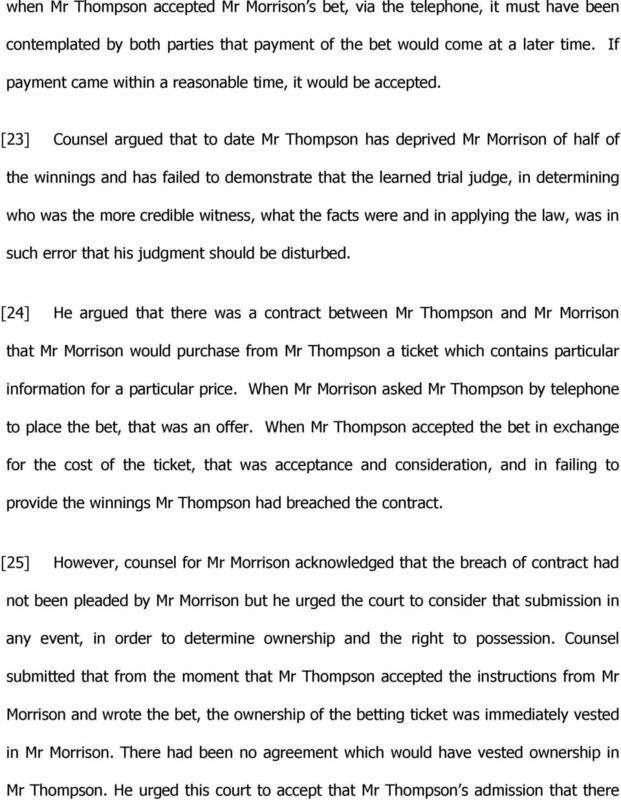 It was Mr Morrison s further argument that Mr Thompson had admitted that there was no agreement made over the phone between himself and Mr Morrison to the effect that Mr Thompson would use his money to buy the bet and share in the winnings. However, Mr Thompson had split half the winnings with Mr Morrison and that showed that he recognized Mr Morrison s right to some of the winnings. 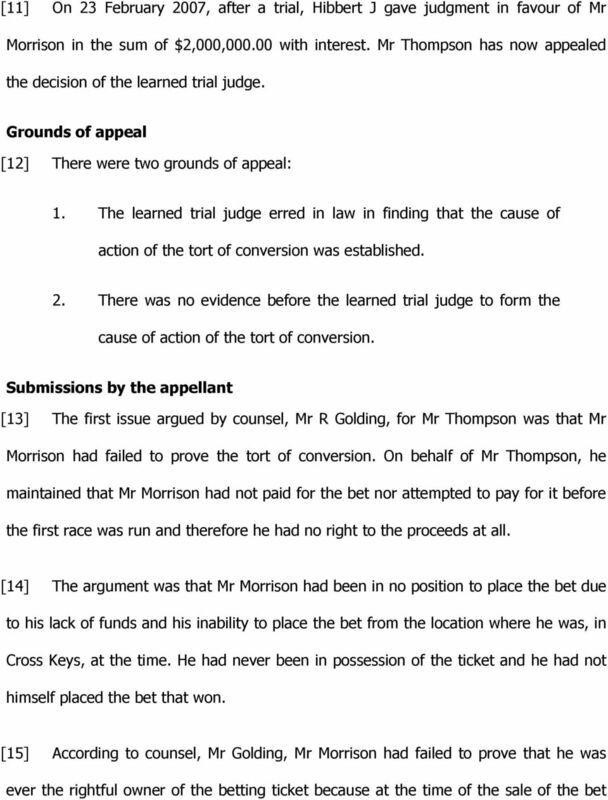 9  Counsel for Mr Morrison argued that there was sufficient evidence before the learned trial judge to prove that both Mr Thompson and Mr Morrison intended that Mr Morrison owned the betting ticket and would have had to pay the cost of the betting ticket regardless of whether or not the bet had won. 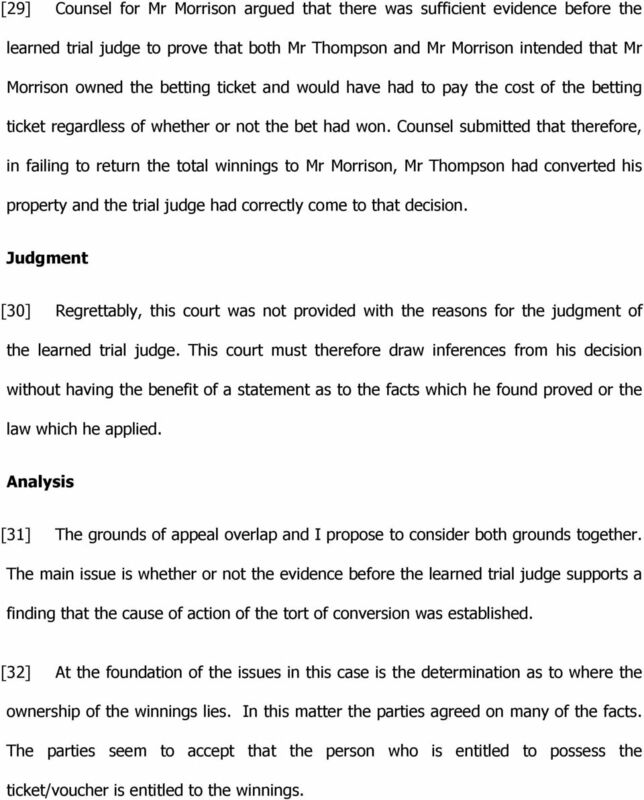 Counsel submitted that therefore, in failing to return the total winnings to Mr Morrison, Mr Thompson had converted his property and the trial judge had correctly come to that decision. Judgment  Regrettably, this court was not provided with the reasons for the judgment of the learned trial judge. This court must therefore draw inferences from his decision without having the benefit of a statement as to the facts which he found proved or the law which he applied. Analysis  The grounds of appeal overlap and I propose to consider both grounds together. The main issue is whether or not the evidence before the learned trial judge supports a finding that the cause of action of the tort of conversion was established. At the foundation of the issues in this case is the determination as to where the ownership of the winnings lies. In this matter the parties agreed on many of the facts. The parties seem to accept that the person who is entitled to possess the ticket/voucher is entitled to the winnings. 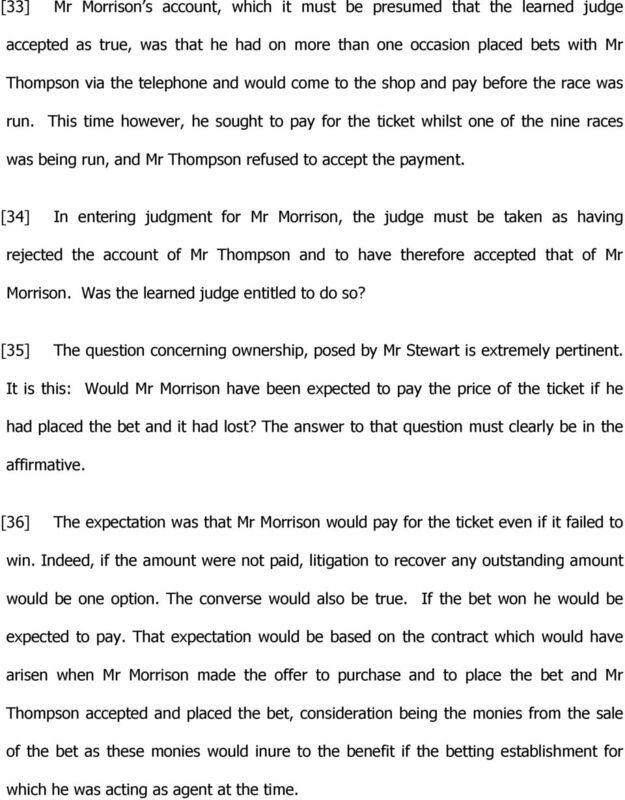 10  Mr Morrison s account, which it must be presumed that the learned judge accepted as true, was that he had on more than one occasion placed bets with Mr Thompson via the telephone and would come to the shop and pay before the race was run. This time however, he sought to pay for the ticket whilst one of the nine races was being run, and Mr Thompson refused to accept the payment. In entering judgment for Mr Morrison, the judge must be taken as having rejected the account of Mr Thompson and to have therefore accepted that of Mr Morrison. Was the learned judge entitled to do so? The question concerning ownership, posed by Mr Stewart is extremely pertinent. It is this: Would Mr Morrison have been expected to pay the price of the ticket if he had placed the bet and it had lost? The answer to that question must clearly be in the affirmative. The expectation was that Mr Morrison would pay for the ticket even if it failed to win. Indeed, if the amount were not paid, litigation to recover any outstanding amount would be one option. The converse would also be true. If the bet won he would be expected to pay. That expectation would be based on the contract which would have arisen when Mr Morrison made the offer to purchase and to place the bet and Mr Thompson accepted and placed the bet, consideration being the monies from the sale of the bet as these monies would inure to the benefit if the betting establishment for which he was acting as agent at the time. 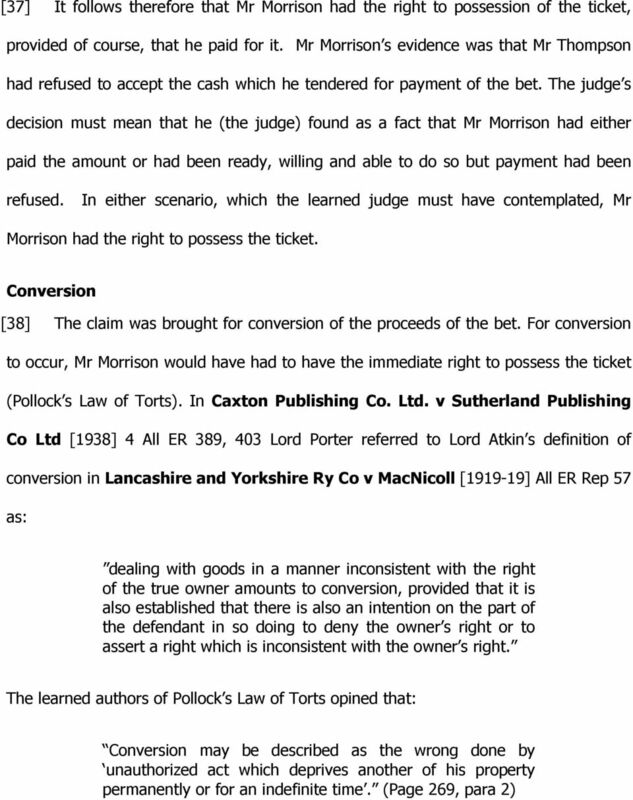 12  In entering judgment for Mr Morrison, it must mean that the learned trial judge, found firstly that Mr Morrison had the right to possess the ticket, and also that Mr Thompson dealt with the ticket in a manner inconsistent with the right of the true owner. The right of the true owner was to use the ticket to redeem the winnings to which he became entitled when the horses he had selected as winners did in fact win their respective races. 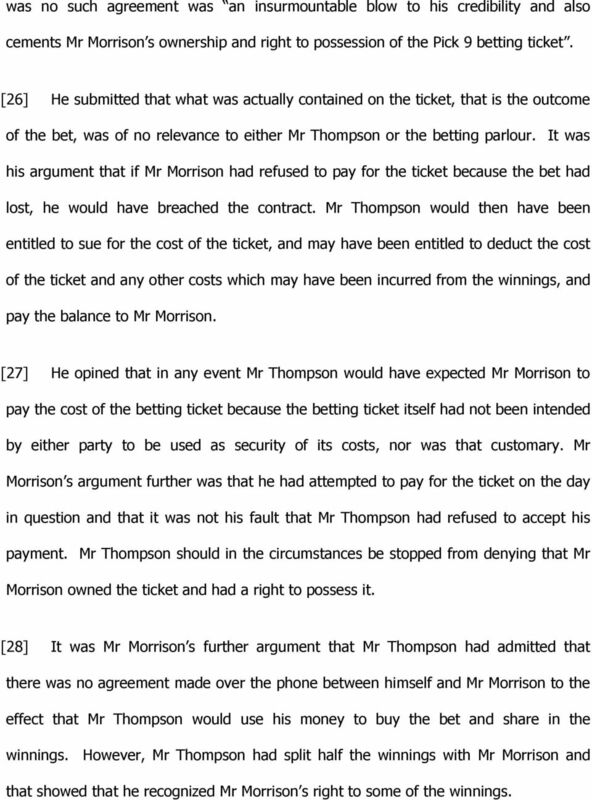 The unchallenged evidence was that Mr Thompson did not provide Mr Morrison with the ticket or the entire winnings. The learned judge was thus entitled to find that Mr Thompson dealt with the ticket in a manner inconsistent with the right of the true owner. For conversion to be proved however, Mr Morrison would, in addition to the above, have to establish that there was an intention on the part of Mr Thompson in so doing to deny the owner s right or to assert a right which is inconsistent with the owner s right. Here again it is unchallenged that it was Mr Thompson who went to retrieve the prize money, without the authority of Mr Morrison, and it was he who retained some of the winnings. These facts provided a solid basis for the learned judge properly concluding, as he must have, that Mr Thompson had an intention to deny the owner s right or to assert a right which was inconsistent with the owner s right. 13 Actions after the races  It is unchallenged that after the dispute arose, it was the mother of Mr Thompson, who was an employee of the betting shop, who caused a document to be prepared which purported to record an agreement for Mr Thompson and Mr Morrison to split the winnings between the two men. Mr Thompson did not sign that document. Rather, it was his mother who signed it, seemingly in a bid to bring resolution to the situation in which her son was. There was no evidence that she was authorized by her son to contract on his behalf, and any contract that there may have been could not, without more, bind Mr Thompson. 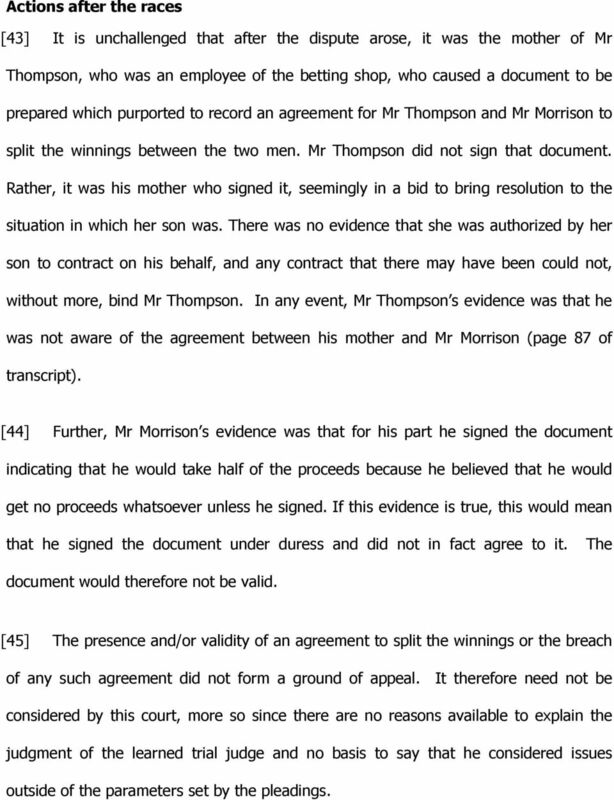 In any event, Mr Thompson s evidence was that he was not aware of the agreement between his mother and Mr Morrison (page 87 of transcript). Further, Mr Morrison s evidence was that for his part he signed the document indicating that he would take half of the proceeds because he believed that he would get no proceeds whatsoever unless he signed. If this evidence is true, this would mean that he signed the document under duress and did not in fact agree to it. The document would therefore not be valid. The presence and/or validity of an agreement to split the winnings or the breach of any such agreement did not form a ground of appeal. It therefore need not be considered by this court, more so since there are no reasons available to explain the judgment of the learned trial judge and no basis to say that he considered issues outside of the parameters set by the pleadings. 14  Nonetheless, in my view, the intention of Mr Thompson to deny Mr Morrison s right to his winnings became more evident by his actions after he collected the winnings. Whether or not a valid contract existed, it is a fact that Mr Thompson gave Mr Morrison only a portion of the winnings, retaining some for himself and that he unilaterally determined the portions. 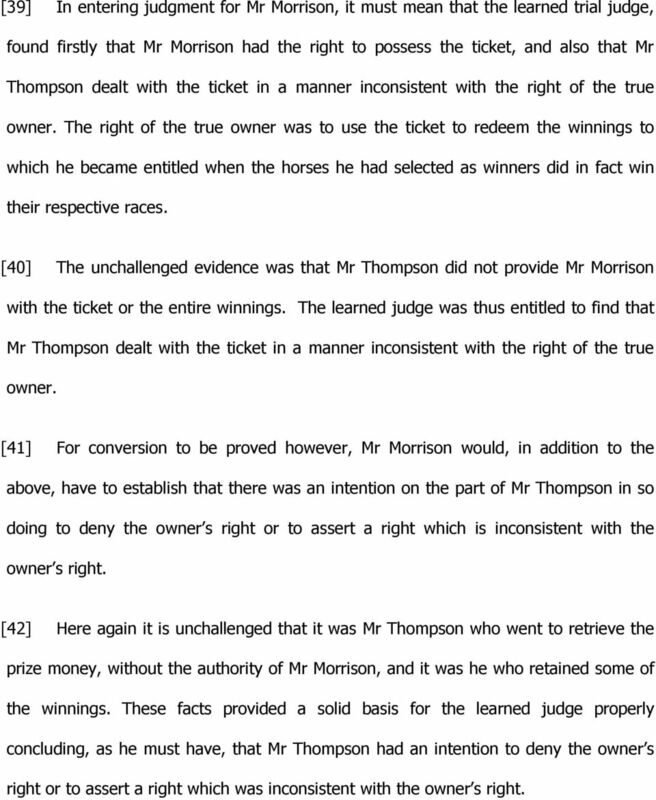 This, to my mind, provided a basis for the learned judge to accept, as he must have, that Mr Thompson s intention was to deny the owner s right to the ticket and winnings or to assert a right which is inconsistent with the owner s right. Conclusion  Based on the judgment pronounced, it must be presumed that the learned trial judge accepted Mr Morrison as a credible witness. In entering judgment for the claimant, the judge showed that he accepted that Mr Morrison was the owner of the winning ticket and winnings. 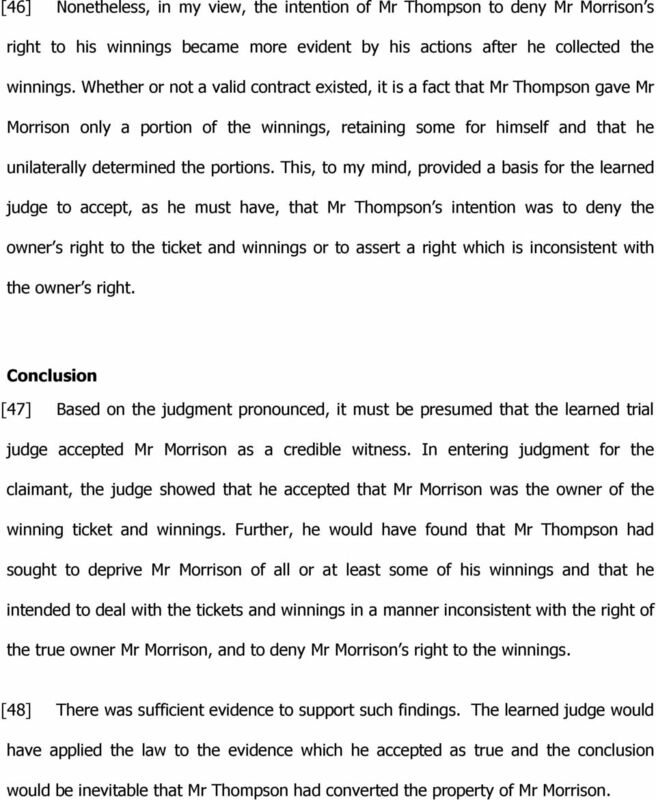 Further, he would have found that Mr Thompson had sought to deprive Mr Morrison of all or at least some of his winnings and that he intended to deal with the tickets and winnings in a manner inconsistent with the right of the true owner Mr Morrison, and to deny Mr Morrison s right to the winnings. There was sufficient evidence to support such findings. The learned judge would have applied the law to the evidence which he accepted as true and the conclusion would be inevitable that Mr Thompson had converted the property of Mr Morrison. 15  The evidence and the law support the decision of the learned trial judge that judgment be entered for Mr Morrison and there is no reason to interfere with his decision. I would therefore dismiss the appeal with costs to Mr Morrison. MORRISON, JA ORDER Appeal dismissed. Costs to the respondent to be taxed if not agreed. UNFAIR DISMISSAL: WHEN WILL THE COURTS ALLOW EXTENDED TIME LIMITS? IN THE UNITED STATES DISTRICT COURT FOR THE WESTERN DISTRICT OF OKLAHOMA J&K BODY SHOP, INC., ET AL., ) ) Plaintiffs, ) vs. ) NO. CIV-11-0077-HE ) ZURICH AMERICAN INSURANCE CO., ) ET AL., ) ) Defendants. IN THE COURT OF APPEAL. and EDMUND BICAR. 2010: March 25; May 3. SAINT LUCIA IN THE COURT OF APPEAL HCVAP 2008/014 BETWEEN: EASTERN CARIBBEAN INSURANCE LTD. Appellant and EDMUND BICAR Before: The Hon. Mde. Janice George-Creque The Hon. Mr. Davidson K. Baptiste The Hon. EASTERN CARIBBEAN SUPREME COURT IN THE COURT OF APPEAL. and LUCA POZZONI. 2014: July 8; September 16. IN THE HIGH COURT OF THE GAMBIA M. GENE FIELDER.PLAINTIFF. ANSUMANA MARENAH (Trading as Julakay Fast Food Restaurant).. Indexed as: Nat v. Wawanesa Mutual Insurance Co. Between Sukhvinder Nat, plaintiff, and Wawanesa Mutual Insurance Company, Hari Somal, Raghbir Somal and Fruitman Insurance Brokers, defendants  O.J. IN THE EMPLOYMENT RELATIONS COURT AT SUVA APPELLATE JURISDICTION CASE NUMBER: ERCA NO. 09 OF 2012 BETWEEN: AUTOMART LIMITED APPELLANT AND: WAQA ROKOTUINASAU RESPONDENT Appearances: Ms. Drova for the Appellant. RE: 1562860 ONTARIO LTD. c.o.b. as SHOELESS JOE S Plaintiff v. INSURANCE PORTFOLIO INC. and CHRISTOPHER CONIGLIO. Defendants v.
SUPPLEMENTARYBENEFIT NOTE ISSUED ON THE AUTHORITY OF THE CHIEF COMMISSIONER Resources moneypossessedby solicitorm agent for clientis actual, not notional,resourceof client;no speculationas to avoidancemeasures. The discovery principle and limitation of actions for solicitor s negligence: Ferrara v. Lorenzetti, Wolfe Barristers and Solicitors (Ont. C.
1. This is an appeal by Gregor McGill FRICS & Gregor C. McGill & Co. (firm). Ontario Supreme Court Ross v. Christian & Timbers Inc. Date: 2002-04-30 Mark Ross, Plaintiff. and. Christian and Timbers, Inc.
UNITED STATES DISTRICT COURT SOUTHERN DISTRICT OF CALIFORNIA. Defendants.